It was very much the case that you had to forget about waiting for the perfect weather conditions to fish last week because it was just not going to happen and you would just have to put up with the wind and showers. However we had a large turnout of customers who did come out and they were finely rewarded with eager feeding fish. The buzz around the bothy was the effectiveness of the buzzer and how savage the takes you were getting on them. Steve Prince proved this point when he had 22 fish for his all day session using the buzzer in tandem with a smoker. Steve will be representing Lochter in the Troutmaster Final at Draycote next week so we wish him every success and hope he enjoys the experience of a big water competition. Big Ash from Aberdeen, that quiet but well know exponent of the subtly fished buzzer had 21 fish to the net for his day, Pete Green from Huntly using the suspended buzzer had 20 fish and Sandy Scobie didn’t need the luck of the Irish as he got 16 fish on a buzzer and blob set up. Speaking about blobs: – The Blobbly Boys – Dougie and Billy from Aberdeen came out for their weekly session on Friday instead of their normal Saturday in an obvious attempt to catch the fish off guard! This they were successful in doing by using the 3 b’s – blobs, buzzers and bachs (diawl) and both were in double figures for their day. The McPhee family from Peterhead had an enjoyable day out with Charlie getting 7 fish, Colin 5 and Jasmine also doing particularly well with 5 fish, all on the blob. Jasmine has represented Lochter for the last several years at the Junior Troutmaster Finals in England, so it is good to see she is getting plenty of practice in for next years event. 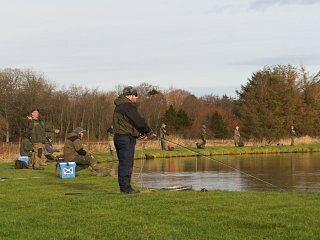 Looking through the returns book – Stephen Leask had over 20 fish on diawl bach and blobs, A Ross on lures and buzzers also had that total, Peter Young on an all day session had 13 fish, Simon Ruddiman fishing near the top of the water got 11 fish on a variety of dry’s, Jim Bain had 10 fish on his favourite orange fritz and the ever reliable Bill Wood had 9 fish to the net on mops and blobs. Our next competition is the Halloween Pairs to be held on Sunday the 29th of October with a 9.30am start. As usual there will be plenty of prizes on offer and the entry fee is £20 per person, which includes a fiendishly fancy lunch! There are plenty of names already down for the popular competition so please contact the Lochter Bothy on 01651 872787 to register. If you don’t have a fishing partner but you would like to enter then simply leave your name and telephone number with the bothy staff and we will see about teaming you up with another single entrant who has contacted us. It is a really friendly competition; so if you have always wanted to enter one then why not give this one a go as it is an ideal starter for your competition career.